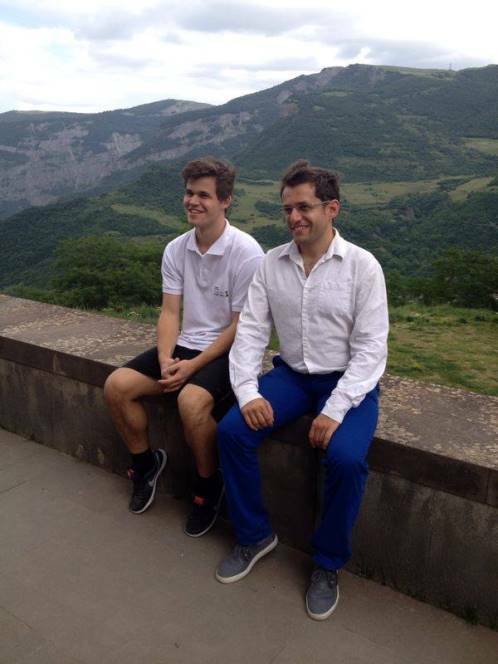 Magnus Carlsen recently visited Armenia with Levon Aronian acting as his impromptu tour guide. During their visit they gave separate interviews with an unusual twist - they were asked exactly the same questions and their answers were later published side by side. We have highlights, including answers to the immortal question, “if you were a chess piece, who would the player be?” We also include brief snippets of an interview with Carlsen and his parents, where his father Henrik recalls reaching the hasty conclusion, “they're definitely not geniuses” about his children. How many hours do you train a day? Carlsen: It depends, but on average it’s probably 1.5-2 hours, or something like that… For the rest of the time I do what I want and that differs each day. I listen to music, play sport. I try to hang out with my friends as much as possible. Aronian: It depends on plans, as there are important meetings that can’t be cancelled, but ideally I try to spend five hours a day on chess and two on sport. Carlsen: I think the way that I approach chess has very much in common with sports, in the way that I prepare for tournaments and the way I conduct myself during tournaments and games. Aronian: Yes, of course chess is a sport. It’s like a bullfight: if you fight and fight and make very beautiful circling movements but in the end the bull pierces you, then nothing you did before that has much sense. It’s the same in chess: if a beautiful game ends in defeat there’s little point to it. If yes, how do you keep yourself in the right sporting shape? Carlsen: I prepare with my trainer and seconds in order to be physically ready to play long games. I practice tactics with the computer and so on, in order to keep learning. Aronian: It’s not a very sporty sport. Chess players over 70, such as Vasily Smyslov and Viktor Korchnoi, have achieved brilliant results. My parents come from the scientific community, so they didn’t take sport seriously, but I got into it myself through my friends and teammates. When I was 20 I started playing sport. Carlsen: Not particularly, only some basic things. I can make an omelette. Aronian: We’ve travelled a lot in Asia and I really like Asian food. I’d say that I can cook, but my family and girlfriend would disagree, so I can only say that I try. I don’t eat meat, but I eat fish. In 2001 I travelled to India, and I really liked the vegetarian food and the fact that there were so many animals. It strikes me as illogical that there are animals who are more use when they’re dead than alive. For example, pigs – what use are they, if you think about it? At least with cows or sheep there are different ways they can serve people. The idea that there are animals that we need only dead doesn’t really appeal to me. Do you follow a routine? Aronian: It’s important to understand when you get exhausted and when you hit your mental peak. If you get up at eight, breakfast, train, then have lunch and then go straight to the game, on the third day you feel that both your play and your mood is awful. Then you need to take the brave decision to drink a glass of wine, go out, watch a film and go to sleep at 2am. Which team do you support at the World Cup? Who do you think will win this year? 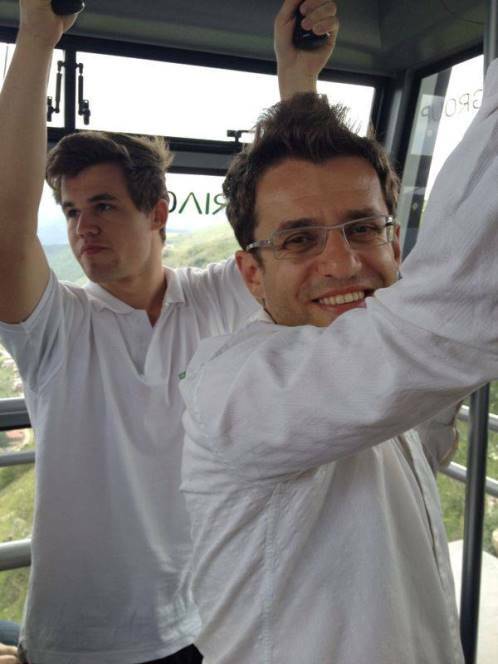 Carlsen: I support Côte d'Ivoire, but I think Argentina will win. Aronian: I’ve always supported England, so there’s no longer much point in me watching the World Cup. I’ve got the feeling the Netherlands will win. They always play well but are unlucky, but this time it seems to me they’ll succeed. Do you have friends who aren’t interested in chess? What do you talk about with them? Carlsen: Yes, some of my friends, particularly school friends, but that’s no problem at all for me. My best friend doesn’t understand anything at all about chess, but he’s a big football and basketball fan, so we can chat about that. Aronian: There are members of my family – my dad’s a physicist and doesn’t like chess or other individual sports. There are friends – musicians, artists – who very rarely ask how I played. That doesn’t bother me at all. On the contrary, it’s nice to talk to people whose inner world differs so greatly from your own since they don’t compete in any kind of combat. Carlsen: Norwegian, English, Dutch and Swedish – a little German. Aronian: I speak Russian, Armenian, English and German fluently. How many moves ahead do you calculate? Carlsen: If I need to I can think at least 15-20 moves ahead, but usually it’s less, as there are so many ways things can develop that there’s no point looking at one scenario so deeply. There are too many possibilities. Aronian: You often miscalculate: it seems to you that you’ve calculated everything to the end, but in actual fact you’ve gone wrong on the second move. There’s a concept of the “tree of analysis”, and if you have no branches, just a trunk, then it’s very simple. Usually, though, there are whole jungles and you won’t find a single serious chess player who’ll tell you how many steps ahead he calculates. Do you dream about chess? Carlsen: Whenever I dream about chess it’s usually in nightmares. Aronian: I often have dreams, and very interesting and sometimes amazing ones. I often tell friends about them and forget them. No, they’re not about chess. Usually they’re absolutely incredible dreams out of Kafka or Platonov. You’re known as the best/second best grandmaster not only today but in the history of chess. What do think about that? Carlsen: I’m not sure about the “best” of all time – that’s subjective, but I definitely know I’ve got the highest rating in history. It’s great. Aronian: To be honest, I’d like to correct you. In terms of rating I’ve already been the second best player for many years, but I’ve always felt there are five or slightly more players who play at the same level. It’s a very good feeling and that’s what I strove for with my parents and those people who helped me, so it’s a collective achievement. If you were a chess piece which one would it be? Carlsen: I don’t know… I think my teacher Kasparov usually had a pretty blunt answer to precisely that question, so I think I’ll refrain from answering. Aronian: It’s hard to say. I like the way Tigran Petrosian answered the question about his favourite piece, saying it was the rook because you can often sacrifice it for an opponent’s good minor piece. I associate myself with a knight, because I really like to travel and I really like to make original moves. If you were a chess piece who would the player be? Carlsen’s manager: Ok, the interview’s taken too long. Thank you. Aronian: I wouldn’t want to fall into foreign hands. For now I do ok on my own and I’d like it to stay that way until the end of my life. At the time, Henrik reconciled himself to the fact that chess would simply be an enjoyable family pastime. "I felt, OK, they're definitely not geniuses, but it doesn't matter. Because, I mean, we loved our children. Chess was something we could do together, just a hobby, like playing cards or anything else." "I think I'm becoming more like my father in a way," he says, laughing. "I'm cracking the same lame jokes!" Many sons probably find themselves saying the same thing, but in the Carlsens' case, there's another dimension. "Whenever I lose," Magnus explains, "usually I want to be alone, figure it out. A couple of times I've lost and I've been complaining to my father about it, and he says, 'Just get up and stop whining.' I think that's the best advice I ever got." The Wall Street Journal also published a video of Magnus Carlsen talking about chess and playing a game against the newspaper’s Jonathan Zalman. It’s fair to say it perhaps wasn’t a game Jonathan will want to show his grandkids!